Inner Circle is a brilliant minimalist puzzler from Zplay. The objective is to rotate colorful rings to match the colors of the inner circle. Divided into 4 colors – Pink, Red, Green and Yellow, the circle rotates changing the position of colors. A ring that appears on the screen is also divided into four same colors. What you have to do is tap the screen to rotate the ring so that the position of the colors on the ring matches with the position of the colors on the inner circle. If the colors on the circle are arranged in this way: Yellow – Top, Pink – Right, Red – Bottom and Green/Aqua – Left, you will have to tap the ring to rotate it so that Yellow appears on the top, pink to your right, red at the bottom and green to your left. The ring fits once the correct color positions are set and another ring appears. The position of all 4 colors of the inner circle may or may not change. 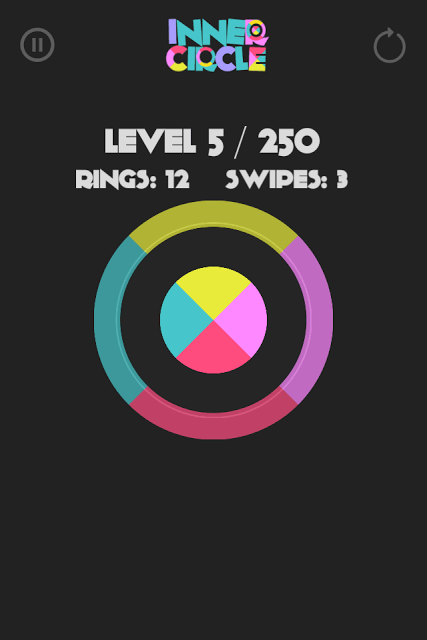 You will have to adapt to the color arrangement and tap quickly before the ring falls and touches the circle. Keep rotating new rings to match the color position of the inner circle. 1. Don’t be in a hurry while rotating the ring. Panicking will lead to wrong matches. Keep an eye on one or two colors on the inner circle and their positions and tap to rotate the ring so that the colors on the ring are in the same position as those colors on the circle. 2. You don’t have look at every color while tapping to rotate the ring. Just look for changes in position of one color. 3. Focus on one or more than one favorite color on the inner circle. Mine are Red and Green. I just keep track of changes in their positions on the circle. So when the circle rotates and the green part of the circle goes Left, I just keep tapping the screen until the ring rotates to make Green go Left. If the Red moves to the top, I just tap the screen until the ring rotates to make the red color get to the top position. You can choose only one color and track its position. 4. Some levels will ask you to swipe the screen while matching colors. Swiping the screen will quickly make the ring fall around the circle. You should swipe after rotating the ring to match the color position with the circle. You can swipe at the last moment, when the ring has reached too close to the circle. 5. When you are close to reaching your objectives, but fail to complete them, you will get a chance to resume from where you left. The game offers to watch an advert. Watch it if you are just 2-3 rings short of reaching the next level. Inner Circle’s simple, but addicting gameplay will keep you hooked for hours. If you love minimalist color-themed games, then you should download it as soon as possible. It’s available on iTunes.